When people contact me they often know what course of action they wish to take. Some people are referred to me by their GP but many are unsure about what help is available, and some people can't identify what is at the root of their distress. But like all of my clients, you are probably thinking that your life could and should be better, and that is why you are looking for somebody to help you to make the necessary adjustments and improvements. Nail Biting, Teeth Grinding (bruxism), pulling hair out (tricholtillomania). Lack of confidence, low self esteem, fear of public speaking, blushing. Relationship problems, lack of direction. In addition to the above I have worked with clients on many other issues and would welcome the opportunity to discuss any concerns you maybe having difficulty with to see if I can be of help to you. My previous work experience also means that I can use a psychotherapeutic approach to physical, sexual, mental or emotional abuse. 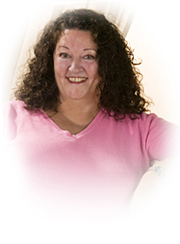 I am Elaine Chambers, a graduate of the European College of Hypnotherapy. I am a member of the General Hypnotherapy Standards Council (GHSC) and listed on the General Hypnotherapy Register (GHR) I studied under the renowned international psychologist Dr Keith Hearne, BSc. MSc. PhD. who is also an acclaimed authority in the field of dream research and is on the Advisory Board of the GHSC. I trained and qualified as a Neuro Linguistic Programming (NLP) Practitioner with John Seymour Associates (JSA) and I am a member of the Association for Neuro Linguistic Programming (ANLP). I completed my Cognitive Behaviour Therapy (CBT) Practitioner Level 1 with the Copewell Institute, a JSA and University of West England (UWE) partnership. I completed my Approved Algorithm Level training with Kevin Laye, a TFT-Dx approved Callahan Techniques ® Ltd trainer. I completed my TFT Diagnostic Training (TFT-Dx) with Dr. Roger Callahan PhD. I am a member of the British Thought Field Therapy Association (BTFTA) and ATFT. Other therapies available in the comfort of your own home include: TFT VT (Voice Technology) which enables me to offer Skype or telephone therapy and TAT (Tapas Acupressure Technique). I am registered on the NHS Directory of Complementary and Alternative Practitioners, and a member of the Complimentary Medical Association (CMA.) I follow the code of ethics of all the above bodies and regularly update my practice by attending Continued Professional Development training courses recognised by them. Prior to launching my own practice I worked for two decades in various people centred organisations. I spent several rewarding years guiding individuals and teams through personal growth and training programmes restoring their confidence and dignity in preparation for work. Later, utilising my social work training, I managed a women's domestic abuse support project, incorporating a children's support programme. I have always been intrigued by human behaviour and interaction, so when I was considering changes in my own personal and career development, I knew that continuing to support other people through positive life changes would remain at the core of my work. A negative experience can continue to affect us much like the repeating ripple effect of a pebble hitting water but the effect of such experiences can be reversed. I have at one time or other, benefitted from all of the modalities that I use in my practice to successfully overcome some difficult issues in my own personal and work life to achieve my personal goals. Therefore I believe that not only does this make me a good advocate for my own work, but also enables me to work empathically with others who are also looking to achieve a more positive and meaningful outcome in their lives. I can help you to achieve your goals by showing you how to uncover and utilise the hidden resources already present within you. The phrase, ‘different strokes for different folks’ is never more apt than when people are looking for, or responding to, therapeutic support. It is for this reason that I adopt a contemporary eclectic approach to my work. The therapeutic process can seem daunting and so I always explain how the processes work before I use them ensuring that you feel at ease and relaxed. Many of the processes during treatment overlap since they are all concerned with both our mind and body. Sessions will therefore often combine various approaches appropriate to the presenting issue. Whether you are concerned with stopping smoking, dealing with childhood traumas, overcoming long standing problems, improving your health or decision making skills, ridding yourself of a phobia, or making changes to enable you to build a new life for yourself by reaching your true potential, we can achieve it for you together, in a relaxed, friendly, comfortable environment. Dipping into the past is sometimes necessary to identify negative memories or patterns that need eliminating, but most of our work together will be a forward looking solution - focussed approach, designed to develop coping strategies and to achieve your goals. For health & safety reasons if you are receiving treatment from your GP or hospital for a medical or mental health condition, I may require your permission to contact them.